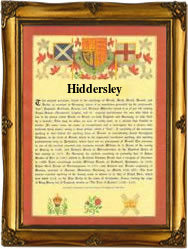 Recorded in the "modern" spellings of Hiddley, Hidderley, and Hiddersley, this is an English locational surname. It is of medieval origins, and almost certainly one of the developed surname forms of the place name variously recorded throughout England as Hadleigh, Headley, Hedley, and Hadley. All these place names derive from the pre 7th century Olde English "haep" meaning heather and "leah", a clearing, a clearing in the heather. In the case of this surname, we believe that from tracing the church register recordings back over several centuries, the name originates from the town of Hadley in the county of Shropshire. It is in the west midland counties and Lancashire, that the name is most prominently recorded. It is just possible that there once was a now "lost" medieval place called "Hidderley" or similar, but if so we have been unable to find any evidence. Examples of the surname recording taken from surviving church registers include William Hidderley of Waterfall, Staffordshire, on December 23rd 1715, Thomas Hidderley, who married Susanna Clyre at Manchester Cathedral, on June 26th 1815, and another Thomas Hidderley, a witness at St Mary's church, Stockport, Cheshire, on May 5th 1847. The first recording of the surname anywhere in the world is probably that of Matilda de Hadlegha, in the pipe rolls of the county of Suffolk, in the year 1195. This was during the reign of King Richard 1st, known as "The Lionheart", 1189 - 1199.